Door Transoms – What Are They and What Do They Do? Transoms separate doors from windows above the door and allow extra light to enter your home when they are placed above exterior windows. The windows are generally rectangular and placed horizontally, and may be sectioned with trim. Door transoms can be used on interior doors, and these are mainly ornamental in nature. They can also be used to provide better ventilation throughout the house. They work especially well in homes that have central air, since these homes don’t have a great deal of air coming in from outdoors. 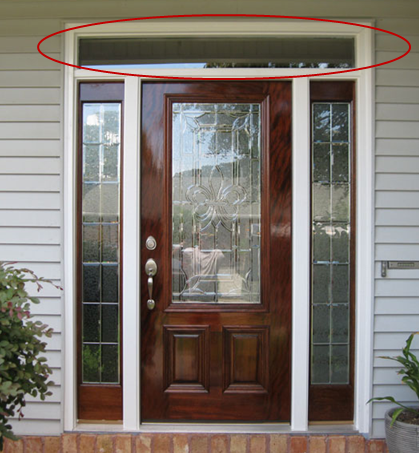 Transoms that are located on exterior doors are sometimes fixed, so that they cannot be opened. They are usually transparent accent pieces but can also be made with stained glass or any pattern customized for that particular door. Door transoms are found in many historic homes, and are used in unique architectural houses today. When used near hallways, they bring light into places that otherwise would be darker without artificial lighting. They can often be found in houses dating to the latter part of the 20th century, when forced air heating and central air conditioning became more commonly used. Door transoms can help to get light into landings on stairways, especially if they are the only windows in that part of the house. Originally, when transoms were more often capable of being opened and closed, they allowed air to be effectively pulled through the house, often by a large fan placed in the attic. Homeowners could open double-hung windows just a few inches, and the transom would allow the attic fan to pull warm air from the house, replacing it with cooler air from outside. Transoms are placed so that they separate doors from the windows found above them. The window above a transom is sometimes called the transom light. It may be a fanlight, which is shaped semi-elliptically. Transoms are sometimes used in strengthening the mullions, when iron stay bars are not used. When they are included for the purpose of ventilating a home, they can be used in various types of windows. While allowing for air to circulate, they also allow privacy and security in a home, since they are small, and placed relatively high above the level of the floors. Transom windows were more commonly seen in apartments and office buildings in the days before central air conditioning became more widely used. Entryways that have a transom window above the exterior door will be bathed with natural light, making them more welcoming and bright. There are various styles of transoms and transom windows, and the styles used in any building are generally determined by the main purpose for their installation. Whether they are being used as ornamental accents, for ventilation or for bringing natural light into a house, they are attractive additions to a home. Transom windows can be purchased with a variety of different types of glass, including obscure glass, Low-E glass or decorative glass. There are optional patterns and grille styles that allow home designers to style the transom after the architecture of the house.